It is time to start planning for 2013, and that means getting a new calendar!! I take very seriously my calendar search and once again this year I am led to Andrews McMeel. They have calendars for all interests and hobbies. Artistic, Comedy, Animals, Inspirational, Travel, Sports.. something for everyone! I love the rustic look and am always drawn to Americana style calendars. This calendar comes in a envelope case to keep it nice until you hang it up in just a few days. High quality printing and paper, this calendar will be one you will be excited to display! "Ellen Stouffer finds joy in the beauty of everyday things and shares it with countless others through her art. In her paintings, she includes objects and inhabitants from in and around her 1848 homestead and draws inspiration from her faith in God, often including a bit of personally meaningful scripture within her work. 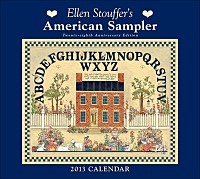 Filled with month- and season-appropriate elements, the artwork by Ellen Stouffer in the Ellen Stouffer's American Sampler 2013 Deluxe Wall Calendar provides a sense of nostalgia with its charming samplers and inspires with its Bible verses." The bake it in a cupcake book looks interesting. Love the cover cupcake! I would like to have Quick-Fix Vegan Cookbook. My brother would enjoy The Calvin and Hobbes Lazy Sunday Book. I love the Daily Cookie! I would like the Harry Potter Magic Eye Book. 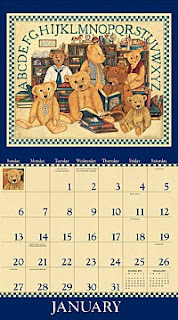 I like the Thomas Kinkade Painter of Light 2013 Large Monthly Planner Calendar.